Ok, I am just going to come out with it, I am a nerd and you know what, I am proud of it. Lets just say that my nerdish behaviour comes from watching way too many episodes of Dr Who, I am what you may call a Whovian and because of this fact I am now frightened of everything. A huge thank you goes out to the producer of Dr Who for make the world afraid of its shadow. I have been watching the episodes since I was a little girl, going into the back bedroom in the old house and being on the edge of my sofa as I got to see what Davros the leader of the Dalek looked like, the cyber men chasing something else and the many evolutions of the doctor all the way from the black and white days of now laughable special effects to the on going stories of today’s new bow tie wearing ledged. I heard tales of people hiding behind sofas when the monsters came out and all I have to say to that is, those people where a bunch of lily livered chickens, it was fascinating not scarey. On the other hand, thanks to Steven Moffat taking over, the list of things that I have on my “things to be wary of list” are ever increasing. Someone has made a list of 101 reasons why Dr Who has left her shaking more than a jelly fish having a samba party, and as I make my way down the list, I start remembering episodes and thinking, oh crud bucket, I just got over that one, back to mental therapy I go….. again. My heart will always go out to David Tennant, he brought a rawness to the character, it was about time that we saw the Doctor get angry but when he left and was replaced by what seemed a uncoordinated fez headed twit, I was angry. Who was this new Who? How was he going to even try and touch the coat tails of talent David had left his regeneration to? Well, it took a while to warm up to Matt Smith but he brought something that no other Doctor had shown us before, the compassion of a close friendship. All Doctors had a companion whom they either befriended and have it requited but Amy was always Rory’s, she would never be the Doctors even though at times you would be sitting there on the sofa shouting at the television “Just kiss already” and then wipe everyone’s mind. On the other hand, I could also not bare Amy being unfaithful to a man who waited two thousand for her and neither could the Doctor. As for the baddies as my mother would call them, the stories running up the revelation of The Silence where conducted so cleverly, then when you saw then everything made sense, huge pat on the back there Steven for that one. Now every time I go somewhere and forget why I went there, the first thing that hits my mind is where the hell is that Silence and where does he get those dashing suits from. At night I am not the best sleeper in the world and at times I have sayings or stories that just come to me and I have to write them down. Now bare in mind it is night and my light is on the other side of the room but the book is an arm length distance away so everything is written in the dark with the wrong hand, so when I wake in the morning all I can see are tally marks and I end up thinking, did I wake or was I subconsciously counting the sharply dressed Silence, if so, at least he could have got my clothes out for the next morning, or better still give me a fitted suit like yours. Then there are the Weeping Angels, oh my, it wasn’t until that episode that I noticed how many statues there are in this world, and as a human race, sadly we are what I would call , screwed. I’m sorry but I just can’t stare at them all, so if you are going to zap me back, can I pick the 60’s, the fashion and music I can feel right at home with. They killed with kindness but where the most brutal at it, sods. As for the Statue of liberty wandering off to the Winter Quay hotel, well I am sure Manhattan would be most disgruntled for that. They are my favourites, they hold an empty quiet of darkness held in a figure of something so holy and angelic, it’s almost like saying you can’t even trust the most trusting of faces, and has possibly left thousands throughout the world with an eye infection through not blinking. I would like to clear on thing up, Fez’s, I am sorry to say are not cool but yes I hightly agree bow ties are, if he throw in a waistcoat and a pair of braces I would change my who wardrobe to match the Doctors, although I do have to admit that I do have my long brown coat, converse shoes and similar suit to David’s, all I need now is a Tardis, and life would be better than fantastic. The question here would be, where and when would I like to go, and to be honest I have not a sausage of an idea because there is so much out there than is unknown and a future that is yet to be lived, I suppose it is very similar is real life . I don’t think I would want to travel alone, I do like to travel but it is always so much more entertaining reliving stories and laughs of those shared with good company. I had just come back from a long journey myself, across a rather wide sea the night before and had only hit the tarmac some ten hours before this image was taken. I was tired, no not tired, exhausted, no not exhausted, my body and mind wanted to find the nearest hole, crawl into it and sleep the jet lag off until the summer came. My brain was on stupid mode and everything for some reason in stupid is stupid, so when I came across this blue box in the middle of a stupid place my first nerdish thought was aha the Dr is here, the bloody sod, he could have given me a quick trip in the Tardis instead of me being jammed into a uncomfortable cattle shed of a plane for tooooooo many hours, moo moo moo. That is the only things I remember of that day are the stupid nerdy blue box and some toast, then sleep, lots and lots of sleep, it could have even been in a hole for all I cared. So that is me for now but I will be back so keep your eyes open and DON’T BLINK. 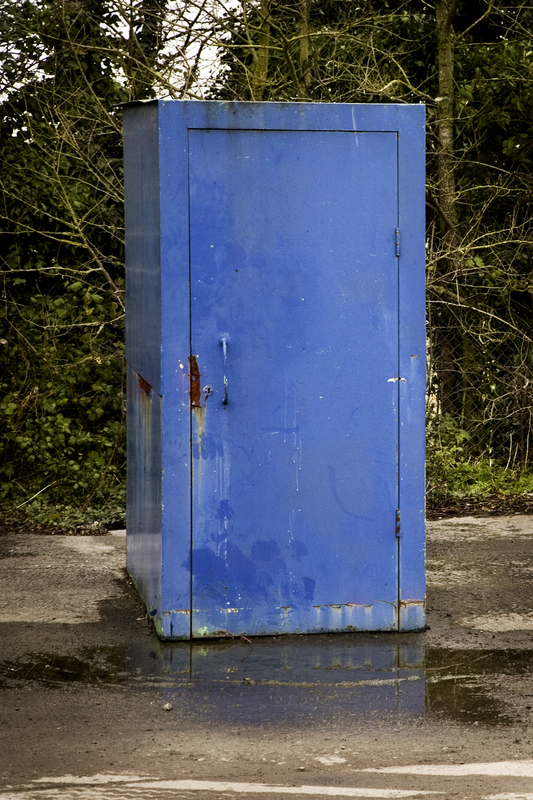 This entry was posted in The 30 day Photo challange and tagged Darlek, Dr Who, journey, Weeping angels. Bookmark the permalink.